One of the reasons I like designing is the opportunity to swatch and fiddle about with different stitches and techniques. Crochet is brilliant for the yarn doodler, pick up your hook, play for a while and if you don’t like it, rip it back. Over Christmas I made quite a lot of bunting, and talking to my friend Lynne a week or two ago, we got on to the subject of how an idea develops from a picture in your head to a finished product – and how easy it is to be influenced by the work of other designers – even when you don’t realise it! This is why I rarely visit Ravelry – it’s just too easy to be influenced, not to mention inspired by all the projects listed there. I sat in front of the tv with my hook and my yarn and played for a while. My first piece was too stumpy, the second looked quite similar to the fabric bunting hanging in my kitchen, yet I still had an idea which wouldn’t go away. Before I knew it I had begun to make paper chains out of yarn. Feeling quite pleased with myself I made enough to hang across the kitchen cabinets and thought what a great submission it would be for 2012 Christmas magazines. It was only later I realised I had seen something very similar before. Ah well, back to the drawing board. 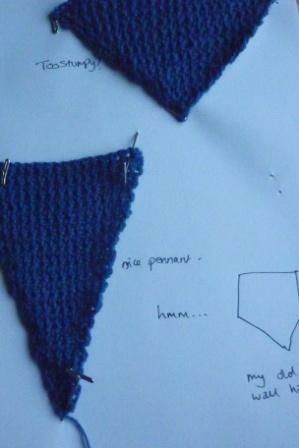 I’ll be posting my final bunting pattern here later in the week. Hopefully you’ll like it as much as I do!